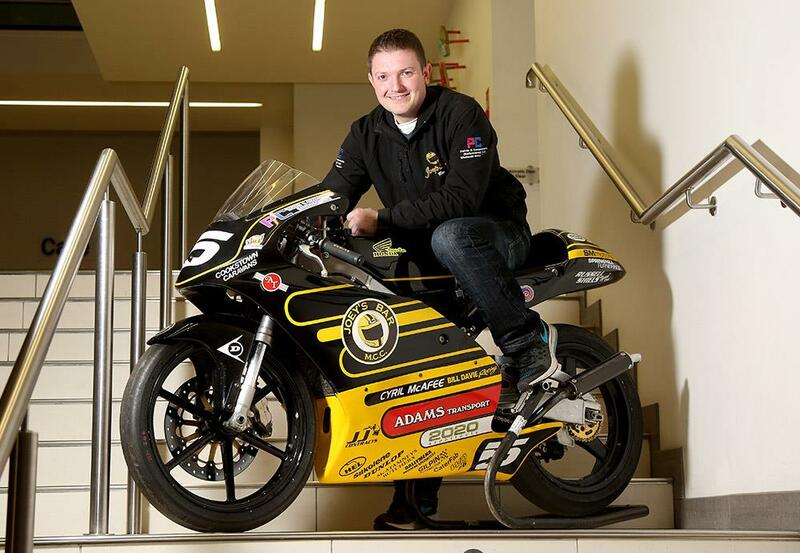 Gary Dunlop, the 32 year old son of road racing legend, Joey Dunlop, is set to compete in his first road race at the Mid Antrim 150 on April 1-2. Joey’s eldest son raced in the 125cc class on the Irish short circuits between 2001 and 2003 but retired from the sport to run the family pub in Ballymoney. “I had always wanted to ride the roads but there was too much going on back then, probably too near my Dad’s death, and it felt like I was being forced into it rather than just letting it happen.” Gary said as he explained his decision to follow in his famous father’s wheeltracks. Last season Gary provided promising young Irish racer, Sam Wilson, with a 125cc Honda painted in Joey’s famous black and yellow helmet colours. When Wilson opted to sit out the Sunflower meeting at Bishopscourt in October, Gary pulled on his leathers and raced the bike himself, finishing in the top four at Northern Ireland’s premier short circuit event. The Ballymoney man plays down that impressive achievement. “The entry wasn’t great, so it probably wasn’t as good as it looks.” he smiles. Nevertheless, the outing reignited a spark and Gary will race the little 125cc machine at the traditional Easter short circuit meetings at Bishopscourt and Kirkistown in preparation for his first foray between the hedges. “I have to do the two Easter meetings to get my roads licence and I need as much track time as I can get before I go out on the roads.” he explained. The Mid Antrim 150, where his father won his first and most treasured road racing trophy after finishing fifth on a 200cc Suzuki in 1972, will not be Gary’s only between the hedges outing in 2015. “I will be doing Cookstown as well and then we will assess things after the TT break.” he says. The older generation of Dunlops cut their racing teeth on two stroke machinery. Gary has inherited this passion for the 125cc and 250cc classes and is determined to help retain their presence on the Irish roads. “I wanted to have another bike out there to support the 125cc class and it looks as if it is working because the numbers are growing.” he smiles. Gary will not be the only Dunlop in action at the season opener at Mid Antrim. His racing cousins, William, Michael and Sam Dunlop are the sons of Joey’s brothers, Robert and Jim. 125cc specialist, William, will be helping Gary with his bike at Mid Antrim and Sam will be sitting alongside him on the grid. “I will be taking it easy, just going out for a nosey around and definitely not breaking any lap records.” Gary smiles.